With focused and clear intention, this sonic call to adventure draws on the traditional shamanic model that is proven over the eons to open the primal mind to access all levels of human experience including the upper, middle, and lower worlds of the shamanic landscape and various transpersonal realms of reality. The Shaman’s Heart II is a powerful and potent shamanic journey that invites the listener to make full contact with their heart – their own inner wisdom and various non-physical helpers, guides and allies, to reveal, release, heal and transform the habitual patterns and blocks that inhibit and stifle their growth and creative energies. Byron Metcalf is a transpersonal guide and educator, shamanic practitioner, teacher, and award-winning professional musician. As a drummer, percussionist and recording engineer, Byron produces music for deep inner exploration, breathwork, shamanic journeywork, body-oriented therapies, various meditation practices and the healing arts. Byron is the creator of The Shaman’s Heart Program and holds a Ph.D. in transpersonal psychology, a master’s degree in counseling psychology, and is a certified graduate of Grof Transpersonal Training and Eupsychia Institute’s Psycho-Spiritual Integration programs. Byron has trained, studied, and worked with shamans, healers, and psycho-spiritual teachers from many parts of the world including Stan Grof, Jack Kornfield, Hameed Ali, John Davis, Ph.D., Angeles Arrien, Ph.D., Jose and Lena Stevens, Sandra Ingerman, and Don Americo Yabar. For over 20 years, Byron has been involved in consciousness research and spiritual development, specializing in the transformative potential of alternative states of consciousness. Metcalf completed Grof Transpersonal Training as a Certified Holotropic Breathwork Facilitator in 1989. Holotropic literally means “moving towards wholeness”, a term coined by Stanislav Grof to describe the category of non-ordinary states of consciousness that possess healing and transformational potential, such as in shamanic states of consciousness (shamanic journeying, healing, etc). As one of the “elders” in the holotropic community, since 1989, Metcalf has facilitated (or co-facilitated) hundreds of Holotropic Breathwork sessions and has conducted two formal research studies that focused on breathwork. Byron so eloquently and masterfully brings rhythm and sound together in a way that speaks to the inner recesses of the soul. Each unique selection has a character of it own. – Annie Compton-Schmidt, d.j., Earthbeat!, KFCF 88.1 fm, Fresno, CA. 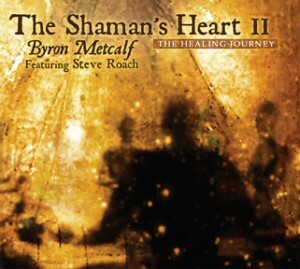 I have used Byron Metcalf’s music in shamanic divination journey work of various kinds, and have found it to be extremely valuable in taking one to the deep, at times frightening inner spaces that one often encounters in self-exploration. The deep resonant bass pulse and driving rhythms keep one moving through the changes, and provide a safe container for this kind of work. – Ralph Metzner, Ph.D., author of THE UNFOLDING SELF. A drum-driven deep meditation and supra-spiritual launching pad, Shaman’s Heart II is 70 minutes of potent shamanic sound-medicine. A steady heartbeat on frame drum sets a confident-guide pace as Byron Metcalf works to open a space, and the journey along this path continues uninterrupted. Metcalf’s array of drums, rattles and shakers work across a stretch of signature sound-swirls from Steve Roach. Metcalf and Roach both contribute serpentine didgeridoo calls to the mix as well, the throaty sounds imparting the feel of lower-world vistas. (There is a point, about 40 minutes in, where the didges blend with a growling chant and ominous pads–here is where we truly find the gate to the lower world, the realm of the serpent, and its intensity and soul-saturating effect is amazing.) As with Metcalf’s previous excursions along these lines, the trance-inducing repetition of the percussive elements lulls the mind to openness and the soft soundcurrents help slow the breath; in tandem the elements carry the listener into some very deep places. While this disc can be listened to casually, and it works well, it’s truly meant as a focused medium for guiding you through inner- and lower-world exploration. I can tell you from personal experience that Metcalf’s brain-salving beats are fully effective even in a non-focused listen, neatly displacing reality chunks of minutes at a time. There’s a familiar feel to the disc; Metcalf and Roach are working within the same sonic framework that informs, for example, the set captured on Roach’s Live at SoundQuest Fest, with some tweaking. Shaman’s Heart II also, obviously, follows Metcalf’s sonic algorithm of bringing you into an inner space through drumming, cutting you loose briefly to drift on the Roachian flow, ushering the drums back in like he’s returning your heartbeat to you, then dropping out for the last few minutes to let you very gently float back to the surface of consciousness. The familiarity doesn’t detract at all from the simple, primal beauty in the flow here or the very effective ability of this disc to displace you from your body for a while. Metcalf’s drumming is rich, layered and energetic, and the power it conveys is immediate. I have fallen under its hypnotic, spirit-releasing spell many times since receiving it, and will continue to use it to open my own gates and journey.